2. HOW TO PUBLISH BOOTSTRAP TEMPLATE ON THE SERVER? After reading them carefully you will be on the right track to have your own website but if you still need assistance then our support team will help as soon as possible. Both types of Bootstrap templates are delivering high-quality websites but of course, the premium type has more benefits. For example, it will be every time upgraded whenever there are added new pages and items in a current template. Therefore, it's entirely up to you which type you want but in both cases, you will be highly satisfied. With Bootstrap website template there is needed a minimum effort since everything is already constructed. You will just need an HTML editor like Adobe Dreamweaver to alter the existing design based on your preferences, wishes, and taste. 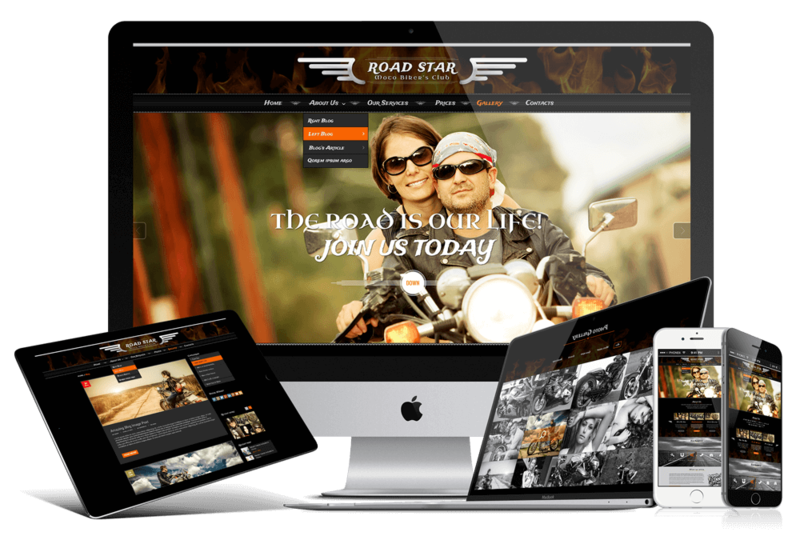 The Biker’s Club website template is for people who are part of this society and want to tell about it to a wide audience as possible, therefore the internet is the best solution for it. One should have a website that will be accessible from anywhere and anytime because people are searching for the information all the time. Bootstrap HTML template solves that problem because it has a fully responsive design which means that website can be opened from any gadget like laptops, tablets, cell phones, computer and etc. The best thing about the responsive theme is that it is changing the design depending on which gadget is used. In other words, the website’s design will always look flawless no matter what device is employed. 1. Home: On this page, you should post the most important and interesting information in order to engage as many viewers as possible. The homepage is the first impression that you are leaving on your potential customer to use it efficiently. 2. About: In this section, you should write about your club’s history, for instance, when and why it was created, what is the ideology that you follow, what are your missions and visions. Tell and present your community, how many members you have and how it is possible to become part of the club. Explain precisely the process of becoming a member and rules that have to be followed. 3. Our services: In this section, you can post about some services that your club is offering. Of course, these services are about fixing motorcycle and bikes, so outline them. Make your potential customers believe that you are the best problem solver. 4. Prices: On this page, you can include the price list for various services that you offer. It is very convenient for customers to have this information in order to be prepared financially before they come to your club. 5. Gallery: In this section, you can post the images of your club, members of it, also process of how you solve problems and etc. If you like the images that are presented in this template, then feel free to use them since they are included in the price that is charged for this theme. 6. Contacts: On this page, you can distribute your contact information like telephone number, email address, address and etc. To present the address, we offer the Google Map location tool to show your exact location. If you do not know how to set up a Google Map location, then please follow this link https://goo.gl/dYNXQn which explains the process in a detailed way. We also offer the contact form which makes the communication process between you and customers smooth and easy. If you have any questions please feel free to ask and leave them in the comment section, our support group will get back to you as soon as possible. To answer your questions fully and explain everything meticulously we offer video tutorial that is recorded by our support team. 4+ pages, more will be added.